Emma Andrews is thrilled to be returning to the Lyceum stage after appearing in Mary Poppins last season! Additional regional credits include three seasons in A Christmas Carol (KC Rep), Oliver! (Musical Theater Heritage), and soloist for Musical Theater Heritage’s Musical Monday. Other favorite roles include Polynesia in Dr. Dolittle, Sally Brown in Snoopy, Dorothy in Wizard of Oz, and Abu in Aladdin. 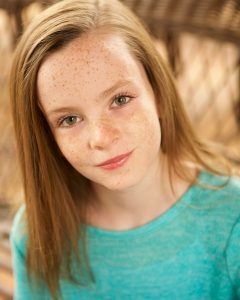 This summer she will be taking on the role of Jemima in Chitty Chitty Bang Bang at Shawnee Mission Theatre in the Park. Offstage, Emma enjoys playing guitar and swimming for the Riptides Swim Team. She would like to thank her family, friends and mentors for their endless support and encouragement.